Celebrate Science will be back at the end of October 2019 with another 3 fun-packed and fascinating days of FREE children's events, activities, workshops and experiments celebrating science! Come along to the 'Celebrate Science' Marquee on Palace Green, the heart of Durham's World Heritage Site where a wide range of free science themed activities will be taking place, including shining light on lung disease, tours of the night sky and optical illusions. Children will be invited to to carry out amazing experiments, participate in astonishing hands-on activities and create their very own inventions, with University experts on hand to answer questions from visitors on everything from fossils to fusion! You can even relax and soak up the atmosphere in the YUM café which will be offering light refreshments in the main marquee. A varied programme of events will also be taking place at University attractions across the City including the Botanic Garden, Oriental Museum and Palace Green Library throughout the festival and half term week, so don't forget to visit them and see what you can discover! So what are you waiting for? Get ready to Celebrate Science! Need a Celebrate Science 2018 poster? Download a copy here! In 2018 over 5,000 people visited the 'Celebrate Science' marquee, interacting with over 200 University staff and student volunteers from ten departments. 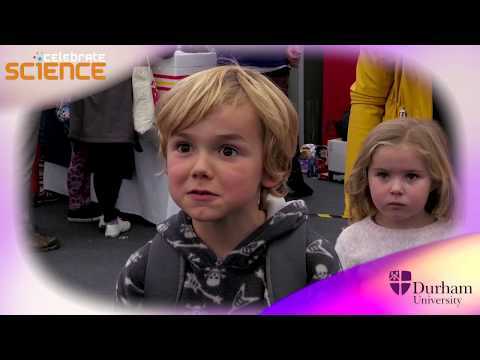 Watch the video to see what our visitors to Celebrate Science think about the event. A host of Free events will be taking place across Durham University visitor attractions as part of the Celebrate Science 2019 Festival. From FREE children's craft activities to science and nature trails. Explore our other venues to see what else you can discover. Set in 25-acres of parkland just to the south of the city, the Botanic Garden is a wonderful place to explore the science of nature. Follow trails through the varied landscapes of the garden, enjoying artwork along the way.